The first reactions to Sunday’s Ben Bishop trade were naturally along the lines of What the hell? Bishop, probably the best goalie in Tampa Bay Lightning history, is headed to a Kings team that only the day before got back its own franchise goalie, Jonathan Quick, after a four-month injury rehab. But there’s logic to this, on both sides—even if logic certainly doesn’t mean there’s not risk. The trade sends Bishop and a fifth-round draft pick to L.A. in exchange for backup goalie Peter Budaj, defensive prospect Erik Cernak (a former second-round pick), a seventh rounder, and a conditional draft pick tied to the Kings’ results. It’s a haul that could amount to something, and even that chance is better than what the Lightning would have gotten for Bishop if they hadn’t moved him before the March 1 trade deadline. 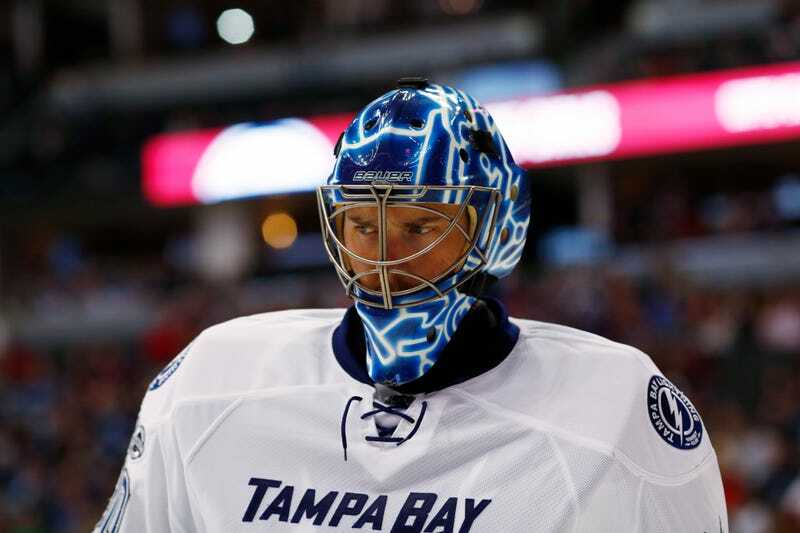 Bishop, 30, will be an unrestricted free agent, and with 22-year-old Andrei Vasilevskiy waiting for his chance to be the Lightning’s clear No. 1, Tampa wasn’t going to re-sign Bishop. With the Lightning seven points back of the second wild card spot, with four teams in the way, it makes sense to sell. And it makes sense to get something for Bishop rather than lose him for nothing this summer. Bishop and Vasilevskiy have more or less split starts this season, and both have been a little disappointing. In 32 games, Bishop has a 2.55 GAA and a .911 save percentage, well off his career numbers, though he’s been much better over the last month. Even so, Bishop’s stats are well behind Peter Budaj, who recorded career bests (2.12 GAA, .917 SV%) while starting in place of the injured Quick. But forget that. This trade definitely doesn’t make sense for L.A. if you believe the two goalies’ numbers this season are more relevant than their career track records. Rest assured that Kings GM Dean Lombardi doesn’t. The Kings are making this trade because of Jonathan Quick, who has played all of four periods this year. Quick suffered a groin injury on open night, and while he looked great in his return to action on Saturday, groin injuries are tricky things, especially with athletic goalies like Quick. It remains to be seen how the Kings will divvy up the starts over the remaining 21 games, but Bishop is, bluntly, a better goalie than Budaj, and nothing bad can come of having a quality goalie right there, ready to step in to various degrees depending on how Quick plays. He’s insurance in case of injury, an elite backup if Quick is fine, a potential No. 1 in case Quick is ineffective, and, even if everyone plays well, he’s a way to extend the 31-year-old Quick’s useful life through this season and beyond. The Kings are three points out of a playoff spot, so this is a pretty standard trade if you ignore the particulars—it’s a bubble team trading assets for a veteran half-season rental in the hopes of a postseason push. The difference, obviously, is that the rental is a goaltender and can’t play every night. But it’s a difference of degree, not of kind. This feels like a fine trade for the Lightning, assuming there weren’t going to be any better offers. (A sizable assumption, of course.) Bishop was expendable to them, they believe Cernak will be an NHL player, and that conditional draft pick could end up as high as a second rounder. For the Kings? That remains to be seen, depending largely on Quick’s health. But they are a better team now than they were 24 hours ago, and they’re better prepared in case of disaster. That seems like particularly forward-thinking GMing, which, tellingly, might be why the trade felt so unexpected.